He eyed me with his blue eyes under long lashes, and I could see an amused dimple forming in his cheek. I fidgeted under his expectant gaze and slumped my shoulders forward. “You really don’t like being wrong, do you?” he laughed. I rolled my eyes. But to be fair, I wasn’t (and still am not) sure if I dislike being wrong more than I like being right. I am a person of strong first impressions. Changing my mind—or being wrong about something—kills me a little inside, but after traveling and being abroad, I’ve learned the strength and downfall of first impressions a dozen times over. Unsurprisingly but notably, the city of Prague is much nicer than the people who work at the train station. And contrastingly, there is nothing like Vienna on a clear spring day, where everything that glitters is probably gold or beer. Usually, I only get pigheaded about being wrong or changing my mind when someone backs me into a corner with my misinformed opinion. Literally, the expression means to turn the omelet—always easier said than done. A Spanish omelet (tortilla de patatas) is prepared by caramelizing diced onion until it gets just a little golden in fragrant olive oil. Next, chopped potatoes are fried in the pan with the onions until they start to brown; at this point the potatoes are flattened in the pan and topped with beaten eggs seasoned with salt and pepper. And here comes the tricky part: after the eggs start to cook and firm up, it is time to dar la vuelta a la tortilla: to flip it onto a plate and slide it back into the pan to cook the other side. I have yet to successfully cook a tortilla without giving half of it to the stovetop, burning the bottom, or it sticking to the pan. Half of the battle is psyching myself up for the challenge—me versus potatoes and eggs, how hard could it be? Mind over matter, and all that crap, yet I stumble every time. “Venga, Courtney, dale le vuelta a la tortilla.” Metaphorically: change your mind, or turn the tables. Mind over matter, and all that crap, yet I stumble every time. Grace was never my strong suit. 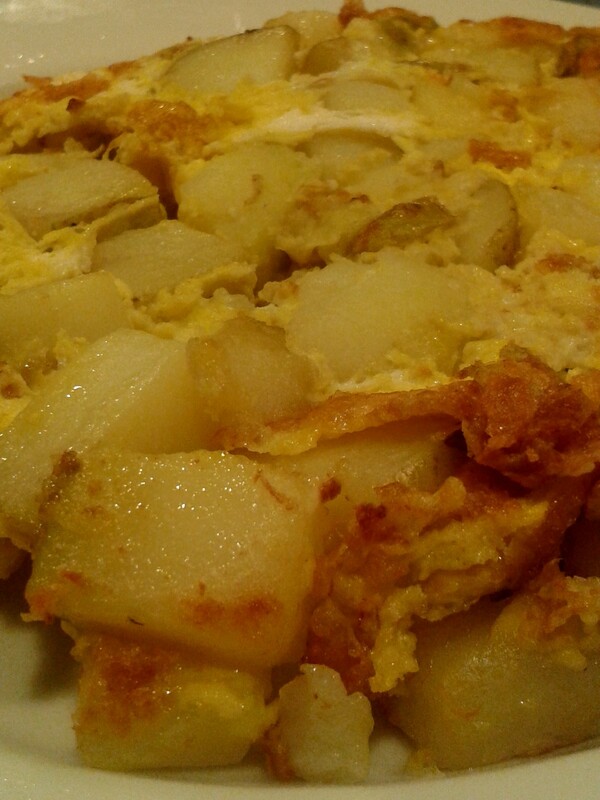 Tags: A Moveable Feast, Barcelona, Gastronomy, Spain, Tapas, Tortilla de patatas. Bookmark the permalink.